Uilleann Pipes Reed Making Guide Introduction. As I experienced myself and has been said by others, reed making is very much a "hands on thing". Mainly because you're working with a material that is not consistent. The cane density varies from "hard" to "soft" and this will force you to alter dimensions constantly. This sounds worse than it is, with time and after many reeds you'll be able to make a good working reed out of almost anything. 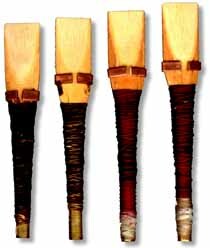 Other woodwind instruments like for example the Oboe are more or less standardized but this is not the case with Uilleann Pipes Chanters. Most pipemakers name the famous Leo Rowsome chanters as their source but every pipemaker follows his own interpretation of that design. And even with the original Rowsome chanters there are not two alike. So, to match the reed to your chanter it's sometimes necessary to alter the given measurements, especially those for the staple. I have tried this reed, of course, in my own Charles Roberts chanter but also in chanters from Dave Williams, Robby Hughes and Brain Howard. And in all it worked like a dream. So there is a fair change that it will work in other "generic D" chanters as well. The reed described on these pages is of the so called Moller/Rogge type and the 'tone chamber' is by no means an invention of myself.